e-Vision Smart Optics recognized in the Top 10 Ophthalmic Solution Providers in MED-TECH OUTLOOK Magazine. e-Vision Smart Optics, a recognized global leader in the development and advancement of patented technologies that enhance vision was recognized for its achievements in MED-TECH OUTLOOK magazine. A publication that provides insight into cutting edge technologies in the medical field. For a list of the Top 10 please click on this link. The story “Through the 21st Century Looking Glass” lets a reader gain insight to the rapid advancements created by e-Vision that are the driving technology behind remarkable products that are now in the market and others that will soon follow. Joel Zychick, CEO e-Vision Smart Optics and the CTO, Tony Van Heugten both provide remarkable insight into the developments e-Vision has made. To read the article, please visit. MITSUI CHEMICALS TOUCHFOCUS™ EYEWEAR EXPANDS ITS SALES TO ALL OF JAPAN AFTER A SUCCESSFUL PRODUCT LAUNCH IN TOYKO, UTILIZING eVISION PATENTED TECHNOLOGIES. TouchFocus™ Next Generation Eyewear expands its market share, including offering an expanded product base that now includes titanium frames into all of Japan with enhanced features backed by eVision Optics patented technology. Mitsui Chemicals TouchFocus™ eyewear is now expanding its retail base moving into retail locations to cover most of Japan. “With designs featuring the “flowing line” design created in collaboration with world-renowned design firm IDEO, the innovation and design are opening up the marketplace utilizing the eVision Optics intellectual property license”, Joel D. Zychick, President & CEO e-Vision. The announcement of expansion follows TouchFocus™ Next Generation Eyewear being awarded the 2018 Good Design Award (Organized by the Japan Institute of Design Promotion). TouchFocus™ was awarded a high evaluation for several reasons. It fundamentally improves the usability of progressive lens by harnessing the power of electricity. Furthermore, all necessary components fit into the frame without interference to the wearer – weighing roughly the same as conventional eyewear. By doing so, the newness of the technology was not overly emphasized. The fact that the frame lineup includes a wide variety of shapes, sizes and materials was also evaluated highly. Overall, the product feels natural, and future wearable devices would do well to take note of the design put forth here. We are looking forward to see how the product is further developed in the future. Mitsui Chemicals also announced they will expand the lineup of TouchFocus™ next generation eyewear by introducing a new series of titanium frames. Mitsui Chemicals, Inc. partnered with one of Japan’s leading metal eyewear frame manufacturers. The soon to be offered frames will be available in different frame colors to include, blue, green, brown, black, and gunmetal. Titanium, with its excellent durability and outstanding aesthetic properties, allows for a thin and visually attractive titanium frame for TouchFocus™. The frames include a one-of-a-kind flat cable, an ultra-thin insulation piece and other parts, specifically designed for the titanium series of TouchFocus™ eyewear that utilizes eVision’s patented electronic wearable frames. The world is taking notice of advanced electronic eyewear technology featured in a news report by the BBC on TouchFocus™ eyewear by Mitsui Chemicals, Inc., utilizing licensed eVision™ LCD lens technology.Breaking news: the British Broadcasting Corporation (BBC) London, England took notice of the new release of TouchFocus™ electronic LCD lens eyewear with licensed technology by eVision™ Optics. The news release featured a story on the new product and how it works. In a recent news report, a BBC reporter introduced the eVision™ technology and demonstrated how the new hi-tech glasses offer an alternative to bifocals utilizing LCD lenses that change focus with a touch. TouchFocus™ eyewear is available in retail stores in Toyko, Japan and is owned by parent company Mitsui Chemicals, Inc. The new eyewear with built in electronic technology helps overcome the vision issues caused by presbyopia. Presbyopia is the loss of near focus as we age and according to a global report by Market Scope (2012), the number of presbyopes is expected to soar to 2.1 billion by 2020. A video produced by the BBC shows the stylish eyewear in use. The reporter demonstrates how the eyewear electronically changes orientation of liquid crystals to shift the focus of the lenses to near reading like bifocals with a touch on the side of the frames. The reporter returns the eyewear to normal prescription viewing with another touch on the frames. “The new Touchfocus™ eyewear is as fashionable as they are functional by utilizing our licensed technology. We are excited to see highly respected global news organizations like the BBC highlight our patented LCD technology,” Joel Zychick, CEO, eVision™ Optics. On sale in Japan and with licensing agreements available around the globe, electronic LCD eyewear technology is now capturing the imagination of consumers as eVision™ continues to drive technological advancements in the world of vision. Companies interested in eVision™ Optics new technology can now view a comprehensive set of videos on the website at www.evisionoptics.com. They can contact the company to view the technology in person with the recent release of a mobile demonstration device that electronically controls different zones of focus in real time. On the website, www.evisionoptics.com has four new videos on the technologies. 1) The homepage features actual footage videotaped through the lens showing the activation of different field of focus electronically. These new videos come in advance of the release of a new white paper and speaking engagement by Tony Van Heugten titled “Electronically adjustable, liquid crystal based accommodating glasses, contact lenses and IOLs”. “This year has been filled with advances for eVision™ Optics including the latest commercial release of the new Touch Focus eyewear by Mitsui. The completion of the electronic lens demonstration device and our new videos will provide a deeper understanding of all of our licensable technologies”, Joel Zychick, CEO, eVision™ Optics. eVision™ works with companies to adapt eVision™ science to their products and embraces a business model allowing companies to participate in the final stages. “By working hand in hand with eVision™ in the final stages of development, licensees have a say in the final outcome”, Joel Zychick, CEO, eVision™ Optics. “With the ability to focus over different focal lengths, many new products and opportunities open up in light of our advancements. With the new videos and the soon to be released white paper, our goal is to make it easier for people to understand our science and how our IP can ensure their products are relevant in the future”, Tony Van Heugten, CTO, eVision™ Optics. The new website’s home page shows an electronic lens as it focuses from distance to near intermediate, intermediate and close up or reading distance. The different focal lengths switch electronically and are controlled by a remote device. The lens default is distance viewing as a safety measure. Other technologies and facility videos are also available for viewing in the video section of the website explaining many of the benefits and future uses for the technologies offered. Today companies in the vision industry are on the hunt for “what’s next” as consumers continue the early adopter trend in selecting products with enhanced features. The rapid advances in technology have opened the door to new products that enhance our lives. Traditional vision care companies are now faced with the same technological challenges of being first to market or face the very real possibility of being left behind. Speeding up internal R&D or securing advanced technological partners in the vision industry has always been a challenge. Companies must create products that are new and offer unique, futuristic features to keep up with consumer demand. “To help companies speed up the process of IP acquisition and make it easier to license technologies like the ones we have created, e-Vision is taking a two pronged approach to licensing our Intellectual Property”, Joel D. Zychick, President & CEO e-Vision. The first step, we continue to build a robust internal licensing department, with a focus on traditional vision applications (spectacles, contact lenses, IOLs and ophthalmic medical devices). This is a logical path for our company, as e-Vision has access to many brands in the industries through its Board of Directors and shareholders. We realized the process for licensing had to be much easier to implement across the vast spectrum of patented technologies we can license to our partners. Today the due diligence, information transfer and licensing process is much easier with our new internal licensing department. e-Vision’s wearable frame technology and Intellectual Property. e-Vision continues to communicate with all companies in need of licensing opportunities in this arena. E-VISION™ ANNOUNCES THE WORLDS FIRST DEMONSTRATION DEVICE FOR LIQUID CRYSTAL ELECTRONIC CONTACT LENSES. A DEVICE THAT UTILIZES e-VISION PATENTED TECHNOLOGY THAT COULD SOON BE FOUND IN ELECTRONIC CONTACT LENSES AROUND THE WORLD. Companies will be able to see how the Electronic Contact Lenses (ECL) now in development will work as the device electronically shifts focus on demand utilizing e-Vision Smart Optics patented technology available for licensing now. E-Vision™ Smart Optics is proud to announce the successful completion of an electronic contact lens platform device to demonstrate the ability to electronically change diopters in real time to prospective licensing partners. “People are amazed as they see the lens in action, realizing how this technology can impact our industry by offering electronic diopter control. Our first in category electronically controlled features must be seen to believe”, Joel D. Zychick, President & CEO e-Vision. The Electronic Contact Lenses will offer impressive features including onboard power/control, remote setting and activation, dimensions that fit within current contact lens size requirements, and up to four diopters of control, or more, that can be switched in 50 milliseconds. Sandwiched between three thin layers of polymer are two layers of liquid crystal, 8 microns thick. In the unpowered mode, the liquid crystal molecules are in their relaxed state and provide no optical power. When a small voltage is applied, the liquid crystal molecules begin to change their optical properties resulting in focus changes in the lens. The current device can be switched to one, two or three diopters of optical power but many other combinations can be designed into it, including higher and more distinct optical powers. The commercial product will have its base optical power molded into the polymer, while the liquid crystal changes the optical power as required. For example, if someone was near sighted, the contact lens would be molded to provide the user with best corrected distance vision, then be able to switch as needed to pre-programmed near focus, close intermediate focus, intermediate focus and distance. All power, electronics, optics and communication components will be inside of the contact lens. The power source will provide energy for a full day’s use and be recharged wirelessly when removed from the user’s eye overnight. The Electronic Contact Lens unit was created to demonstrate how the final product will perform. A small camera allows the focus changes to be seen on a monitor, plus the lens can be removed from the camera and hand-held to look through and see with your own eyes the focus changes. “The device makes an impressive statement when you consider the scale required for the electronics and the increased performance Electronic Contact Lenses will provide”, Tony Van Heugten – Chief Technology Officer of e-Vision. Helbling, known around the world as a leader in electronic advancements in integrated technologies, is a valued partner behind this new technology. The global contact lens market is anticipated to reach USD 17.72 billion by 2025, according to a report by Grand View Research, Inc. (Aug 2017). An extension of contact use from 1-5 years in the existing base of contact users, could increase the contact lens profits in the industry by billions. E-Vision Smart Optics, Inc., headquartered and with laboratories in Sarasota Florida, develops technologies related to the eye care industry. Electronic Liquid Crystal Eyewear to Become a Reality in 2018 Mitsui Chemicals Inc., Tokyo Japan, with business interests in Japan, Europe, China, Southeast Asia and the USA, has announced the upcoming 2018 launch of eyeglasses that switch electronically between near and distance viewing utilizing e-Vision patented eyewear technology. Utilizing “TouchFocus,” self activating touch sensor, in-frame battery and electronic control, this new product switches from near to distance in an instant. The rechargeable battery originally designed for about 10 hours of continuous use has proven to work up to two weeks as tested by internal employees. This battery combined with embedded electronic technology allows the user to control their eyewear through out the day. “We are excited to see this new product move into launch, as this is another example of our patented technology providing advanced performance based on our science”, Joel D. Zychick, President & CEO e-Vision. E-Vision Smart Optics, Inc., headquartered and with laboratories in Sarasota Florida, develops technologies related to the eye care industry. The Mitsui Chemicals, new “TouchFocus” glasses, targeting the presbyoptic market utilizes patents from the e-Vision portfolio of 375 patents issued and/or pending and the 150 patents owned by third parties, that e-Vision controls. E-Vision continues to be on the cutting edge of technology, another notable patent use is the current development of tunable optics e-Vision is developing for NASA. Anthony Van Heugten, James Allen and Harry Milton today presented a scientific poster at the 2016 NASA Human Research Program Investigators’ Workshop, the annual meeting for NASA- and NSBRI-funded investigators. 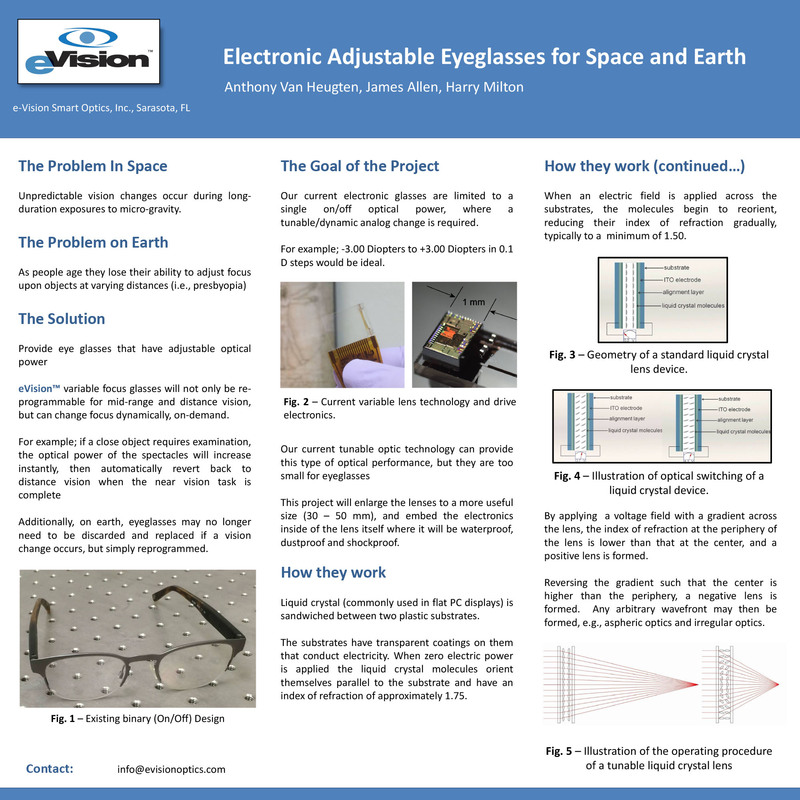 The poster describes the development program for e-Vision’s Electronic Focusing Eyeglasses to address loss of vision in astronauts during long-term exposure to microgravity on space flights. Applying E-vision’s platform technology, Smart Focus Optics™, these Electronic Focusing Eyeglasses will feature an almost infinite number of prescription settings. The wearer will have the ability to instantly change far, near and middle-vision settings, which will be customized to the individual’s own needs. These eyeglasses have the potential to provide astronauts with an immediate solution to visual changes that occur in space and may be useful to aid in an astronaut’s visual accommodation on earth once the space tour has been completed. E-Vision is developing Electronic Focusing Eyeglasses for space travel under a grant from NSBRI-NASA. The theme of this year’s workshop is “Frontiers in Human Space Exploration Research.” The workshop’s goal is to provide an informal, collegial atmosphere for cross-disciplinary interaction. E-Vision Smart Optics, Inc., a Sarasota-based company specializing in electrically-modulated tunable lens technology, announced today that it is developing the first electronic contact lens (ECL) that will allow the wearer to continuously adjust far, near and middle-vision customized to the individual’s own needs. This proprietary lens-based technology, already fabricated for electronic focusing eyeglasses, ophthalmic diagnostic equipment and in development with the U.S. military for augmented-reality head mounted displays, will now be integrated into standard contact lens designs. Several important strategic efforts support e-Vision’s accelerated timeline to bring this fully tunable ECL to market. E-vision recently closed a round of financing within its existing shareholder base to fund this development program. Additionally, the National Space Biomedical Research Institute (NSBRI), a science institute established by NASA, this week issued e-Vision a grant to develop the first fully tunable electronic eyeglasses to address the deterioration of vision that astronauts experience during space travel. E-Vision has nearly 550 patents issued or pending worldwide to protect its intellectual property. Its latest patent issued on October 13, 2015 (US 9155614 B2) titled, “Flexible dynamic electro-active lens,” provides exclusive use to e-Vision for the use of any flexible lens containing electro-active materials. E-Vision’s ECL will have the same look and feel of a traditional flexible contact lens, but unlike fixed lenses, it will allow the wearer to select pre-set focus ranges to change prescription in as little time as 200 milliseconds. Featuring the Company’s Smart Focus Optics™ platform technology, the ECL contains an electric field surrounded by a tiny, near invisible layer of liquid crystal material (similar to the screen on a laptop or smart phone). When powered with tiny amounts of electricity (microwatts), uniquely placed electrodes activate the liquid crystal layer and specific optical focus profiles can be achieved. These profiles can create hyperopic or myopic spherical shapes as well as aspheric shapes. E-Vision’s ECL power requirements are incredibly efficient so the lens can operate independent of frames or wearable charging stations. E-Vision has been a pioneer in electronic lens modulation with more than 15 years of experience designing and fabricating optics that control and shape light with no moving parts. E-Vision’s platform technology, Smart Focus Optics™, relies on electrically modulating optics and lenses to refract, diffract or diffuse light. This tunable technology can be applied to lenses of any kind – including eyeglasses, contact lenses, intraocular lenses, VR & AR systems and camera lenses. And, it can be integrated into either flat or curved surfaces, whether rigid or flexible. E-Vision is a privately held Delaware-based Corporation with its development facility and administrative offices located in Sarasota, Florida. The parent company was established in 1999 and its initial focus was technology licensing and transfer activities for lens-based applications. In 2010, e-Vision created Smart Optics, Inc., to expand its development platform to also address all conventional and/or fluidic/liquid lenses that have electronics associated with them. For more information, please visit www.evisionoptics.com.